As part of one of my project, I have to work on two physical systems. So, I don’t have any option than connecting both of them at my desk maintain two keyboards and mouses. When ever I want to switch between computers, I have to swing my chair to reach other keyboard and mouse. This is really painful and I have to switch like this for more than 100 times a day. Initially I thought of of using a KVM. But I am afraid after looking at it’s cost. That too, I have multi monitors connected for one of my system, that means I have three monitors now. 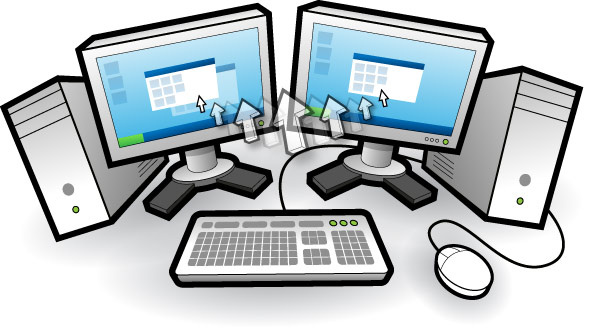 If I use a KVM, I can not make use of multi monitor. That time, I dreamed about a application which easily takes your mouse control from monitor of one machine to monitor of other machine, when it reaches end of first one. My friends said, it is out of scope. I too felt that and days are rolling….and I have no option than to swing my chair every time. Visit Product Site, if you want to give a try. Let me know if you know any other tools which perform like this.